A Text book of Physics in Five Volumes, coauthored with J.H. Poynting: (1) Properties of Matter, (2) Sound, (3) Heat, (4) Light, and (5) Electricity and Magnetism. Dated 1901 and later, and with revised later editions. 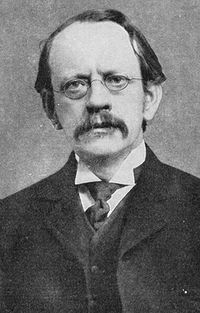 J.J. Thomson, ""On the Structure of the Atom: an Investigation of the Stability and Periods of Oscillation of a number of Corpuscles arranged at equal intervals around the Circumference of a Circle; with Application of the Results to the Theory of Atomic Structure," Philosophical Magazine Series 6, Volume 7, Number 39, pp 237–265. This paper presents the classical "plum pudding model" from which the Thomson Problem is posed.